Ms. Macomber has written a delightful series with the town setting based on her real life home town! 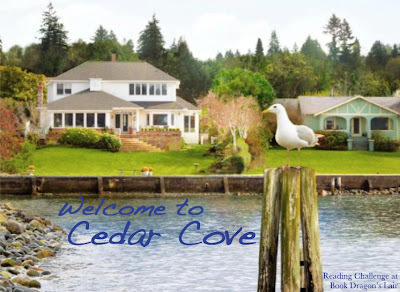 Visit her website for a look at all the books she has written or skip right to her Cedar Cove page which has cover graphics, book descriptions and links to excerpts. As a personal challenge, I will finish reading this series. Why don't you join me? Must they be read in order? I don't think so but I will be. I think it will spoil some of the previous story lines. I'm pretty sure each is a stand alone book, except book 12. If I remember correctly each book has characters from the other stories but they're there just in passing. Book 12 gives us a chance to catch up with everyone....and say good-bye. The first 9 books were re-released with new covers in 2010 so they shouldn't be too hard to find and with the author's popularity, your local library may have a copy. Ready? Since I'm still trying to figure out InLinkz.....sign-ups are at the bottom of my blog posts. There are two down there, Cedar Cove and Landover (info, just in case). I've been wanting to try this series for several years, and there's no time like 2012 to get started. Is there going to be a sign-up here, or is there one already that I've just missed? Thanks for commenting on my blog I would love if you would join my challenge and I'm glad you are contemplating doing the challenge again this year.